Family Style School: Running around! For Christmas my mom bought me a FitBit. This has been an amazing gift. Many of my friends have them. We have competitions all the time. It's based on how many steps you take daily. My most to date is just over 30K. This has encouraged me to begin running. More steps faster! Yea-ah! 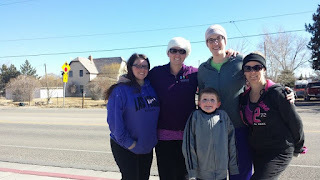 Since Christmas I have ran a 5K with my friends, a 10K on my own and I am now training for a 1/2 marathon. My very first! This Fit Bit has given me a new outlook on running. I can seriously say that even though I am brand new, I feel that running has changed my life. It has shown me that I can do incredibly hard things. I think a lot while I am running. Running has since become my sanity saver. I never thought I would say this, but I just love running now! The new me, that's who! Take charge of your own life. OWN IT!